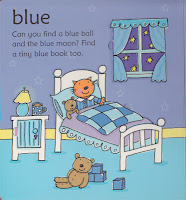 My son loves this book; he was playing with this book everyday when he was 1 to 2 years old. 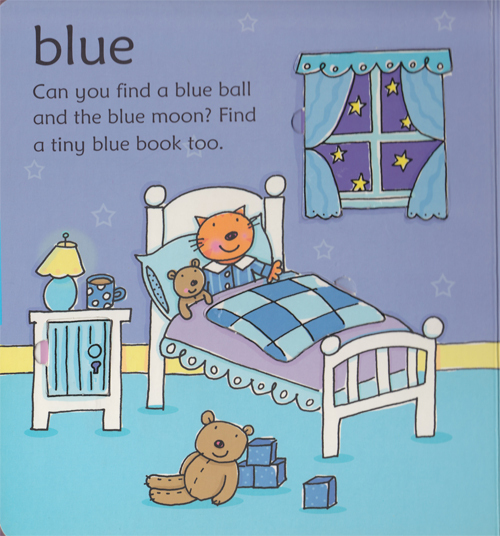 The book introduces a color every 2 pages and there are a lot of lift-out pieces for the kids to play and to practise puzzle skills. We can also teach the kids the concept of "in" and "out", "front" and "behind"
The small picture on the right is a page introducing Blue. The window, comforter, small cabinet are the lift-outs which the kids can take out and see what are under.